Saints have signed Wests Tigers’ Shannon McDonnell to replace Jonny Lomax who the club have revealed will now miss the rest of the season. McDonnell played for Saints on a short-term contract during the 2014 title-winning campaign, again after being signed as cover for the luckless Lomax. The 27-year-old has been playing for Wests Tigers since leaving Saints towards the end of 2014. He played three games for Saints before his season was ended by a fractured jaw. 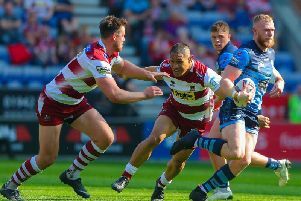 “It’s clear with Jonny Lomax out for the season and Paul Wellens currently sidelined that we need cover at full back as well as in the backs,” Saints chief executive Mike Rush said. Shannon started his career at the Tigers and also played for Newcastle Knights in the NRL. He represented New South Wales at Under 19s and was an Australian Junior Kangaroo. In 2011, he moved to Hull KR and two years later joined their rivals at the KC Stadium. As well as making more than 100 career appearances, he played for the Exiles in 2012. He will wear squad number 34.